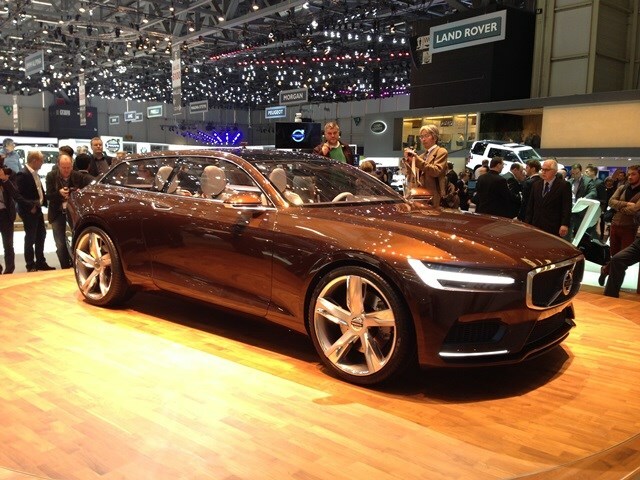 Volvo has been on something of a concept car mission of late and the Geneva Motor Show revealed the Swedish brand is not letting up. Following on the heels of the Concept Coupe at the German Frankfurt Motor Show in September 2013, the Concept XC Coupe in January 2014 at the Detriot Motor Show in the States, the Concept Estate shows the Swedish brands design interpretation for its future estate models. While much of the car design is futuristic it does give a clue to how the next generation Volvo estates are going to look at the front, particularly the style of the headlights. It’s not thought likely that Volvo will produce a three-door estate but it does reveal how the next generation Volvo V70 estate could look like. What will also translate through to the next generation Volvos is the in-car entertainment system. Out goes the traditional button-infested central panel located between driver and passenger and in comes a large touch screen. Volvo is promising that this will be one of the most intuitive systems to use and enable the driver and front passenger to easily find which ever function they are after, whether it be sat nav, music or climate control. It will use touch control in much the same way as Apple’s iPad does and combine it with the option of voice control. This is to also help ensure the driver’s focus remains on the road thereby enhancing safety – a major goal for Volvo. Volvo has recently launched its new compact premium car, the V40, last year, and it’s expected the next new Volvo model to be unveiled will be the large off-roader, the XC90.